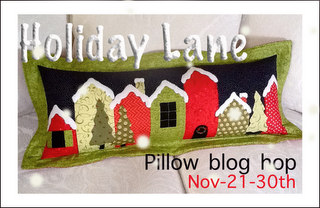 Holiday Lane Blog Hop has started!! Thanks Pauline and Mdm Samm for Hosting another great HOP!! When I saw a picture of this cute "little" pillow, I knew I wanted to join. so I got the pattern and looked at my fabrics. I actually didn't have any or hardly any Christmas fabrics, then I remembered this tree skirt I started making (top done) and I had plenty of scraps left over. So more untradtional colors and fabrics. Here's all the pieces cut out. And applique pieces ironed on, now since I chose a white background the white snow on the houses, blend it together, even though it's a different white. Here it's easier to see. And do you see the size of this pillow?? I didn't quilt the pillow BTW, I just didn't feel like it. Here the flash is on. And my daughter wanted to sleep with it right away. Here's a list of the other participants today. Have fun looking at more pillows!! Do you have enough scraps to make me one? Then I can enter it on the 30th when my entry posts! What a precious pillow Bea and it looks like it matches the colors of the quilt on the wall in your daughter's room! What neat fabrics! This looks so great in those fabrics! Lovely and so cheerful! Oooh its lovely - I love the colours and patterns you have used. Love your color choices, and such a cute model too. Will it get to spend the Christmas season on her bed? It does look lovely there. Sikke en skøn blog du har fået lavet. Det ser rigtig godt ud. Skønne huse. I kan bare derover vest på. What a great Holiday Lane you made, I love the colors and fabric. Your daughter is a lucky girl with this display of winter fun on her bed! Very cute, I really like the colours you used, very original! thanks for sharing! What a great color way!! Nice job! Love the fabric line you used! What a great pillow. The colours look lovely and your daughter seems very pleased with it. Very nice pillow, even with other colors. Thanks for sharing. Job well done and your daughter proves that!! Love how it plays with the colors of the room! Great job! Wow, those scraps were a great idea! I love the non-traditional fabric. They make the pillow so much more fun. Great job! You are a better woman than me! I had to hand stitch the opening closed I just couldn't get it close enough to the needle :) Love your pillow. Oh Bea. what a delightful pillow and your daughter certainly looks like she embraces it too...I adore your color choice for fabric...mmmm others will too today..go take a peak..
Just perfect! Love the colors. You sure are in a "blue" mood these days. Lovely color and fabric choices! Your pillow is quite lovely (so is your daughter. Nice change from the traditional. Super cute~ Great fabric choices!! I want one.It`s just fabulous and love your fabrics choice!! Cute pillow! It looks so lovely on the bed! Adorable. Love the greens and blues. Perfect for a little girls room. Thanks for the inspiration! Nicely done - I can see why your (cute) daughter likes it. We'll have a blue, blue Christmas! I couldn't help but think of that song "Blue Christmas" but in no way does it make me sad! It's so bright and cheerful in the fabrics you chose! Wonderful job! Your pillow is my favorite out of all of them. I love the colors. Good job. It looks very Christmasy to me. Very cute pillow! Your daughter is one lucky person. Loved the super cute fabrics you chose!! Your pillow is beautiful...I love the colors! Your daughter looks quite comfy on her pillow. Love the colors! The snowman and snowflake fabrics are fantastic! Thanks for sharing! Congratulations on being on the top 3 list! This pillow is almost like a sweet cake. I LOVE your pillow in it's 'untraditional' colors---no wonder your daughter wanted to lay her little head on it---it's adorable. :) Happy Thanksgiving. Very cute. I really like the fabric choices. Nice job! It looks wonderful. Great job! Sweet pillow! Love the choice of fabrics. Thanks for sharing. That is gorgeous, I can see why your daughter wanted to sleep with it right away. It looks so inviting. I like the way you put the edge on. Thank you for sharing. Very cute Bea! Love your colours. What a cute pillow! Thanks for sharing. I love your choice of fabrics...great job. See you on November 26th...my day. Happy Thanksgiving! What a beautiful color variation! I love what you did! Love your pillow. It really turned out great. din puder er bare så flot, du har helt sikkert fortjent at den blev valgt til Top 3 of the day, tillykke! Skønne farver, jeg kan godt forstå, at din datter er vild med puden. I love this. Snowmen are a favorite of mine, they look great as house fabric. Lucky daughter! Your pillow is wonderful and love the "untraditional" colors! Thanks so much for sharing. Hey, that's a wonderful pillow and I love the different color combination. Thanks for the close-ups of the stitching. I had no idea the pillow was so large until yesterday when the hop started. Your pictures really tell that story! Isn't it nice when we make something and someone loves it! Great job! Pretty pillow, glad your daughter likes it, I hope she let's you borrow it for Christmas? Great color palette! So glad your daughter loves the pillow! Your pillow is adorable! Great job! Thanks for sharing your pillow. I can see how much your daughter loves it!! Love, love, love your fabric choices! What a great gift for your daughter! Thanks for participating in the hop! I love your blue version and your daughter looks very happy. She can dream of snow and Christmas! I love it done in blues! Very pretty! Your pillow looks like it was made especially for your daughter's bedroom. I love the colors. Hi!!! Your pillow is beautiful and I love the colors you used!! !